On Sunday, the American Youth Symphony — widely considered the finest young, pre-professional orchestra in the country — played John Williams’ complete score for E.T., the Extra-Terrestrial, live to picture at UCLA’s Royce Hall. It was only the third time ever in Los Angeles (Williams himself conducted it at the Shrine Auditorium in 2002, David Newman conducted the L.A. Philharmonic at the Hollywood Bowl in 2015). 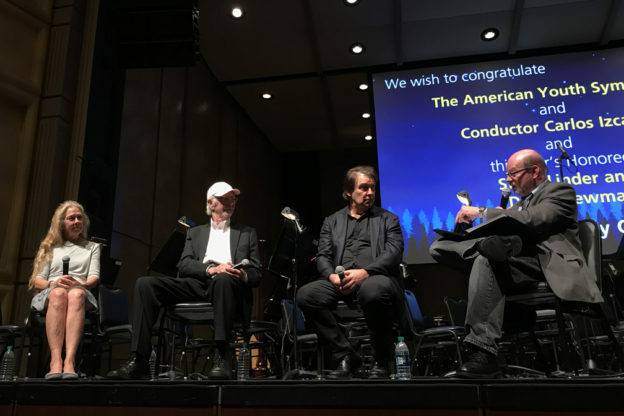 Prior to the concert, I conducted a fun Q&A with two musicians who actually played on the original 1982 recording sessions: David Newman, then a violinist on his way to becoming an Oscar-nominated composer and one of the world’s finest conductors of film music in the concert hall; and Ralph Grierson, a top studio pianist who performed the difficult but beautiful end-title solo. Joining us was Katie Kirkpatrick, whose mentor Dorothy Remsen played the magical harp solos in the original; who played that part for Newman at the Bowl in 2015; and who inherited Remsen’s harp, named it “Dottie” and still plays it today. Here is a rundown of the concert and the honorees dinner that followed. This entry was posted in and tagged American Youth Symphony, David Newman, Dorothy Remsen, E.T. in concert, E.T. the Extra-Terrestrial, Film Concerts Live!, John Williams, Katie Kirkpatrick, Ralph Grierson on November 21, 2017 by Jon Burlingame.